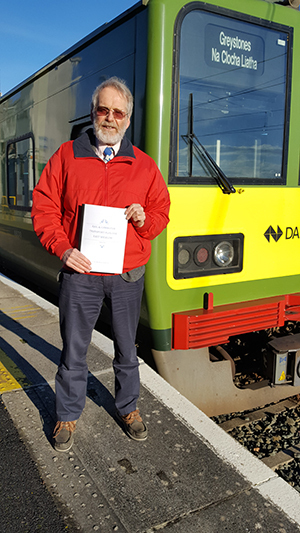 Cllr Derek Mitchell has written a detailed paper proposing a tripling of train capacity on the Wicklow line by providing; an extra diesel service at peak hours; increasing the number of carriages from 4 to 8 and providing an extra DART from Greystones. Also express buses on the N11 from Arklow with Park n’ Ride & cycle parking there, Wicklow Town, Newtown, Kilpeddar and Glenview. These should copy the successful 84x and use the M11 and bus lanes into Dublin. Some should also go, at peak hours, to Sandyford and the LUAS at the Red Cow. 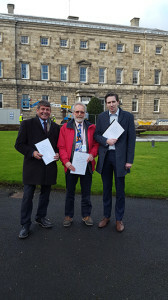 Derek launched this Plan in Leinster House on Thursday with Minister Simon Harris and Minister of State Andrew Doyle. The long term National Transport Authority Plan is to provide a good service from Dublin to Bray but provide a worse one South of there. They plan to use a Shuttle train South of Greystones with everybody changing at Greystones. A previous shuttle on the line was a disaster and was so unreliable that people stopped using it, in 1992 the march against the bad service was attended by 200 people. 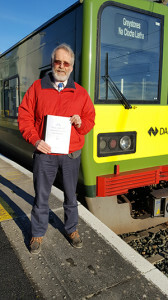 The NTA want to eliminate the direct Wicklow diesels to provide a more frequent and better DART service in Co. Dublin. Already the train service to Wicklow is very poor as priority has been given to Dublin. So many stations have been opened that the average DART speed to Bray is only 30kph. Usage to Carlow is 3 times that of Wicklow Town because of a better service. ‘My Plan provides 3 direct Diesel trains at peak hours as it is not acceptable to eliminate them from the DART tracks. All other rail lines interwork diesels with the DART. 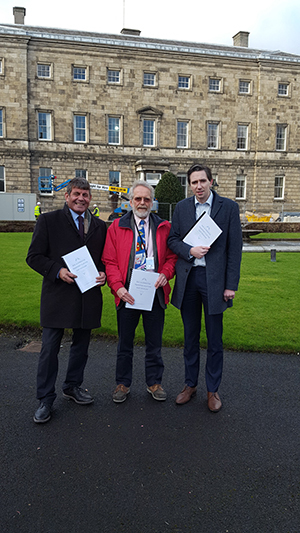 This Plan has a limited cost, mainly extra carriages and lengthening platforms South of Greystones following a survey which I have done’ said Cllr Derek Mitchell.